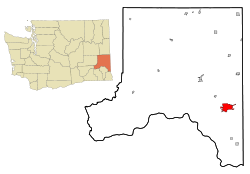 Pullman (/ˈpʊlmən/) is the largest city in Whitman County, located in southeastern Washington state within the Palouse region of the Pacific Northwest. The population was 29,799 at the 2010 census, and estimated to have reached 31,682 in 2014. Originally incorporated as Three Forks, the city was renamed after industrialist George Pullman. In 1876, about five years after European-American settlers established Whitman County on November 29, 1871, Bolin Farr arrived here. He camped at the confluence of Dry Flat Creek and Missouri Flat Creek on the bank of the Palouse River. Within the year, Dan McKenzie and William Ellsworth arrived to stake claims for adjoining land. They named the first post office here as Three Forks. In the spring of 1881, Orville Stewart opened a general store and Bolin Farr platted about 10 acres (40,000 m2) of his land for a town. Pullman was incorporated on April 11, 1888 with a population of about 200 people. It was originally named Three Forks, after the three small rivers that converge there: Missouri Flat Creek, Dry Fork, and the South Fork of the Palouse River. In 1884, Dan McKenzie and Charles Moore (of Moscow) replatted the site and named it for American industrialist George Pullman. On March 28, 1890, the Washington State Legislature established the state's land grant college, but did not designate a location. Pullman leaders were determined to secure the new college and offered 160 acres (0.65 km2) of land for its campus. Idaho Territory had established its land grant college in 1889; the University of Idaho was to be in neighboring Moscow. On April 18, 1891, the site selection commission appointed by Washington's governor chose Pullman. On January 13, 1892, the institution opened with 59 students under the name Washington Agricultural College and School of Science. It was renamed the State College of Washington in 1905, more commonly known as "Washington State College," and became Washington State University in 1959. In 1961, Pullman became a non-chartered code city under the Mayor-Council form of government. The city has an elected mayor with an elected seven-member council and an appointed administrative officer, the city administrator. Pullman is situated across four major hills which divide the city into nearly equal quarters: these are Military Hill, north of the Palouse River and west of North Grand Avenue; Pioneer Hill, south of Main Street and the downtown area, and east of South Grand Avenue; Sunnyside Hill, south of Davis Way and west of South Grand Avenue; and College Hill, north of Main Street and east of North Grand Avenue. Companies associated with an expanding high-tech industry are at the city's north end, anchored by Schweitzer Engineering Laboratories (SEL). The lab company was founded by Edmund Schweitzer, a Ph.D. graduate of WSU. SEL and other firms are within the 107-acre (0.43 km2) Pullman Industrial Park, run by the Port of Whitman County. 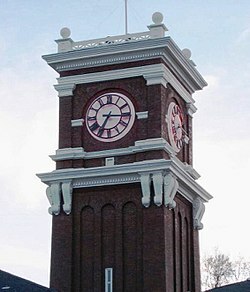 The WSU campus is on College Hill, and part of the area is a historic district listed on the National Register of Historic Places. The historic character of College Hill is manifest in its many early-twentieth century craftsman-style bungalows and two streets which retain their original red brick paving. See Red Brick Roads of Pullman, Washington (NE Palouse St./NE Maple St.). College Hill is also the location for Washington State University's Greek Row as well as home to several bars. Many students reside in this neighborhood making it a lively place to spend time with lots of activity during the weekend nights. Popular bars in the area Stubblefields, The Coug and Valhalla. Stubblefields is known primarily for its basement dance floor and three large bars. The Coug is popular as a sports bar, with signatures and pictures littered over every inch of wall space. Valhalla is close to Martin Stadium which makes it a very busy place on football gamedays. Pullman is the site of the largest and original campus of Washington State University (WSU), a member of the Pac-12 Conference (Pac-12) in NCAA Division I. WSU is well known for its veterinary medicine, business, architecture, engineering, agriculture, pharmacy, and communications schools. Pullman is at 46°43′59″N 117°10′19″W﻿ / ﻿46.733°N 117.172°W﻿ / 46.733; -117.172 (46.733, -117.172). at an elevation of 2,352 ft (717 m) above sea level. According to the United States Census Bureau, the city has a total area of 9.88 square miles (25.59��km2), all of it land. The water supply is a natural aquifer. The surrounding region, called the Palouse prairie, or simply the Palouse, is noteworthy for its fertile rolling hills where winter and spring wheat, barley, lentils, and peas are grown. Pullman's climate is classified as dry-summer humid continental (Köppen Dsb), using the 0° threshold for mean coldest winter month; it nearly qualifies as having a warm-summer Mediterranean climate (Köppen Csb). This climate is typified by warm, dry summers followed by cold, snowy winters with short transitional seasons in between. Owing to the protective nature of the Cascade Range to its west, clear skies occur regularly throughout the year and rainfall is drastically less frequent in comparison to cities west of the mountains. Clouds of any variety are especially scant between June and September, which contributes to a diurnal temperature variation that is much higher during the summer compared to winter. Pullman averages 21 inches (530 mm) of precipitation throughout the year. The warmest month is August with an average daily high of 82 degrees (27.8 °C), while January is the coldest month with an average daily high of 35 degrees (1.67 °C). Precipitation is highly seasonal. Virtually no precipitation occurs between June and September, while the period of mid November through mid March commonly receives snowfall. Rain, though sporadic, is mostly recorded during the transitional seasons. December and January are the snowiest months, respectively, averaging 7.80 inches and 7.09 inches each. Areas of snowpack accumulate every winter and frequently last into March before melting entirely. Snowfall can also occur in the transitional months of October and April, though it is uncommon and usually melts within a day. As of the census of 2010, there were 29,799 people, 11,029 households, and 3,898 families residing in the city. The population density was 3,016.1 inhabitants per square mile (1,164.5/km2). There were 11,966 housing units at an average density of 1,211.1 per square mile (467.6/km2). The racial makeup of the city was 79.3% White, 2.3% African American, 0.7% Native American, 11.2% Asian, 0.3% Pacific Islander, 1.9% from other races, and 4.4% from two or more races. Hispanic or Latino of any race were 5.4% of the population. There were 11,029 households of which 17.1% had children under the age of 18 living with them, 28.5% were married couples living together, 4.7% had a female householder with no husband present, 2.1% had a male householder with no wife present, and 64.7% were non-families. 34.5% of all households were made up of individuals and 4.4% had someone living alone who was 65 years of age or older. The average household size was 2.18 and the average family size was 2.88. The median age in the city was 22.3 years. 11.3% of residents were under the age of 18; 51.8% were between the ages of 18 and 24; 21.7% were from 25 to 44; 10.5% were from 45 to 64; and 4.7% were 65 years of age or older. The gender makeup of the city was 51.3% male and 48.7% female. As of the census of 2000, there were 24,675 people, 8,828 households, and 3,601 families residing in the city. The population density was 2,740.8 people per square mile (1,058.6/km2). Hispanic or Latino of any race were 3.86% of the population. The average household size was 2.23 and the average family size was 2.87. 4.5% who were 65 years of age or older. The median age was 22 years. For every 100 females, there are 104.6 males. For every 100 females age 18 and over, there were 104.7 males. The median income for a household in the city was $20,652, and the median income for a family was $46,165. Males had a median income of $36,743 versus $29,192 for females. The per capita income for the city was $13,448. About 15.3% of families and 37.5% of the population were below the poverty line, including 20.0% of those under age 18 and 3.6% of those age 65 or over. Pullman is served by the Pullman-Moscow Regional Airport 2 miles (3.2 km) east of Pullman and 4 miles (6.4 km) west of Moscow. Horizon Air offers four flights daily from Pullman-Moscow to Seattle and four flights daily from Seattle to Pullman-Moscow. Shuttle service to Spokane International Airport is available. Major bus routes, including Greyhound, pass through Pullman. Pullman is also served by Pullman Transit which provides service for many residents and students of the university who do not live on campus. WSU students can get on the bus by showing their student ID card, as all students pay a fee for use of the bus system which is included in their fees when attending WSU. Bloomberg Businessweek chose Pullman in 2011 as the "Best Place to Raise Kids" in Washington. Factors include affordability, a family-friendly lifestyle, the quality of Pullman High School, the presence of Washington State University, and the natural environment of the area. Neighboring Moscow in Idaho received the same recognition for that state. Since 1989, Pullman has been home to the National Lentil Festival, a major community event celebrating the lentil legume grown in the surrounding Palouse region. The festival includes a lentil cook-off, Friday night street fair, Saturday parade and music in the park, and more. It is held on the August weekend before fall semester classes start at WSU. Pullman is the sister city of Kasai, Hyōgo, Japan. Henry Townley Heald, alumnus of Washington State University (1923 B.S. in civil engineering), and former president of the Ford Foundation, New York University, Illinois Institute of Technology, and American Society for Engineering Education. Klay Thompson, current NBA guard for the Golden State Warriors (drafted in 2011), played for 3 seasons with WSU. ^ "Lori Cofer's Blog: Pullman, WA - A Bit of Paradise on the Palouse". Pullman WA Real Estate. 2008-11-17. Retrieved 2012-03-15. ^ "Pullman Public School District #267 / Homepage". Psd267.org. 2011-07-19. Retrieved 2012-03-15. ^ "Monthly Averages for Pullman, Washington". Weather.com. 2010. Retrieved 2010-04-16. ^ United States Census Bureau. "Census of Population and Housing". Retrieved October 3, 2013. MacGibbon, Elma (1904). "Columbia River and Pullman". Leaves of knowledge (DJVU). Washington State Library's Classics in Washington History collection. Shaw & Borden. Wikivoyage has a travel guide for Pullman.